Setup a Virtual Safe Zone to make sure your child isn’t taken from or doesn’t Leave your neighborhood. DON’T Forget – Use the promo/coupon Code “AMBER when ordering to get $100 off! Safe Zone – Define an area in your neighborhood, school district or any where you choose and receive an alert when your GPS is carried outside that location. Web Tracking – you can go right on your desktop or laptop computer anytime to see the whereabouts of your child at any given moment! 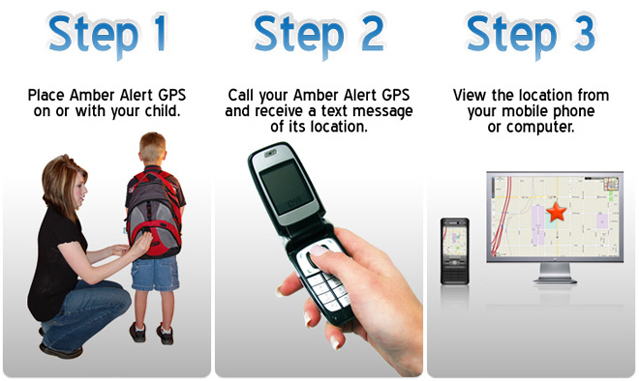 SOS Button – Teach your child to press the GPS SOS button when they need help or when they are in danger and you will immediately receive an alert with their location. Speed Alert – Receive a notification when your GPS surpasses a specific speed that YOU have set and know immediately when your child is in a car. Great for speeding teenagers! Bread-Crumbing – You can have the Amber Alert GPS unit send you messages on a regular time schedule, set by you, to tell you the exact whereabouts of your child from moment to moment. This will save you time of having to call the GPS unit every time you want an update (only available with “Unlimited Plan”). Temperature Alert – This is a completely new feature that will allow you to be notified when your child and their new GPS unit are in an environment that is too hot or too cold…i.e. in a hot car in the summertime. Page Command – If you misplace or lose your unit or if you can’t find your child while you are in the same store or building, simply use the page command and a unit will emit a loud noise which will help you locate your unit. Destination Alert – Want to know when you child has reached a destination, like school or a friend’s house, this alert will let you know. Low Battery Alert – Nobody wants to run out of battery power when they are tracking their child. So, now we have an alert to let you know if the unit is low on power. Voice Monitoring – for an additional fee, the voice monitoring will allow you to listen in to the situation your child finds him or herself in. 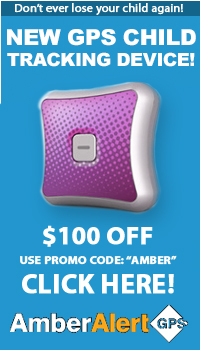 DON’T Forget – Use the promo/coupon Code “AMBER” when ordering to get $100 off!